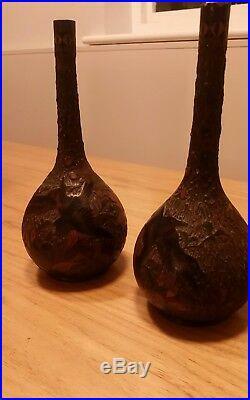 A very rare pair of genuine Japanese cinnabar totai shippo vases. 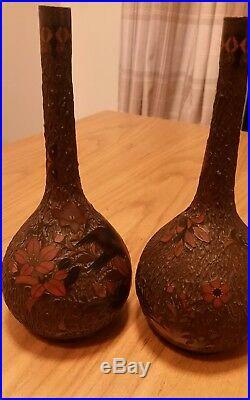 These date to the Meiji period, decorated with birds, leafy pattern and tree bark background. Provenance : A memento of a voyage by Captain J S Cox on the S.
S Duke of Argyll 1886. The item "Rare pair of genuine antique japanese cinnebar totai shippo vases meiji period" is in sale since Wednesday, December 12, 2018. This item is in the category "Antiques\Asian/Oriental Antiques\Japanese\Vases". The seller is "frathesco" and is located in Chelmsford. This item can be shipped to United Kingdom, Austria, Belgium, Bulgaria, Croatia, Cyprus, Czech republic, Denmark, Estonia, Finland, France, Germany, Greece, Hungary, Ireland, Italy, Latvia, Lithuania, Luxembourg, Malta, Netherlands, Poland, Portugal, Romania, Slovakia, Slovenia, Spain, Sweden, Australia, United States, Canada, Japan, New Zealand, Israel, Hong Kong, Norway, Indonesia, Malaysia, Mexico, Singapore, South Korea, Chile.